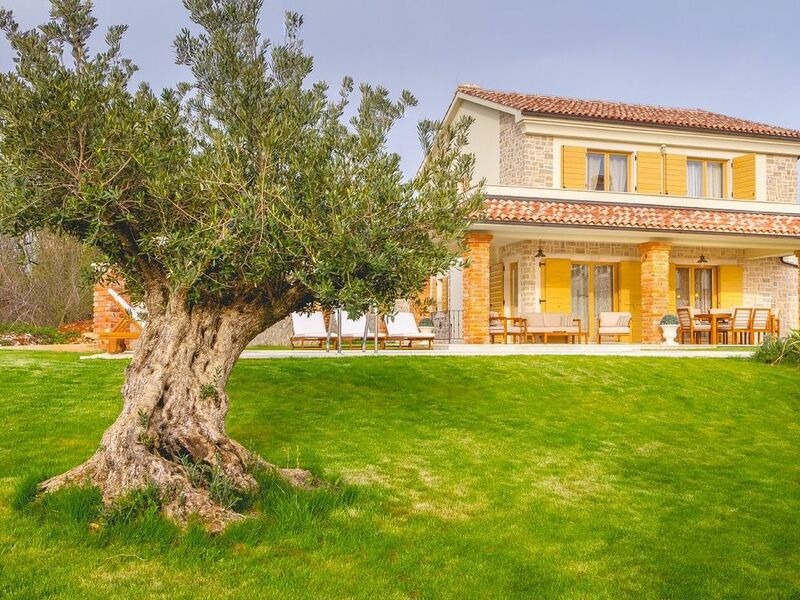 Luxury Villa Tia***** is one of the villas within the newly built villa complex located in Kras on the island of Krk, only 7km away from the sea. The villa is decorated in a way that is very harmoniously decorated with natural materials and rustic style. The villa has three bedrooms where up to eight people can be accommodated. There are two bedrooms with a double bed and a private bathroom, while one room has 2 bunk beds and can accommodate 4 people and also has a private bathroom in the room. The bedrooms are located on the first floor. The interior of the villa is decorated in accordance with tradition - walled beams and wooden furniture in the living room, and parquet in bedrooms. Ground floor with spacious living room, dining room, kitchen and bathroom. The villas are air-conditioned and free internet access is available. Villa has a "konoba" - a space built in a suburban environment. In this area you also have a sauna and a mini gym. Guests also have an outdoor pool ideal for refreshments, as well as a spacious sun terrace with matching sun loungers. At the end of the pool there is an outdoor grill, and a little further covered terrace suitable for a carefree vacation. Surrounded by greenery, these villas provide their guests with the peace and comfort needed, far from the noise, but close to the lively tourist spots. The villa's surroundings are fantastic for nature lovers who love cycling and strolling through the woods. From the villa to all the attractions on the island of Krk, it is a 15-minute ride away, and some of the most beautiful bays and cleanest Northern Adriatic beaches are only a 10-minute drive away. Meine Frau, Sohn und ich, haben uns sehr wohl gefühlt in den 2 Wochen wo wir das Haus gemietet haben. Sehr geschmackvoll eingerichtet. In der Küche war alles vorhanden was man zum Kochen braucht. Das Wohnzimmer mit dem Großen TV und Couch war sehr gemütlich. Alle Räume, Pool Außenanlagen usw., sehr sauber gewesen. Unten im Keller Fitnessraum, Sauna + Weinflaschen (die man natürlich extra bezahlen muss) vorhanden. Die Ausflüge zu den Städten Puna usw. alles in ca. 15 Minuten mit dem PKW erreichbar. Für mich war Puna die schönste Stadt. Der Strand war auch toll für meinen 7 Jährigen Sohn. Alles in allem ein schöner Urlaub für uns. Würde jederzeit wieder hinfahren. The Municipality of Dobrinj is located on the eastern part of the island of Krk with the analogue centre. Dobrinj is located on a 200 metre-high hill and is one of the medieval castles, which in the past was a centre of literacy. The special value of this beautiful village is the cognition that Saint Stephen's parish church had already been mentioned as early as the 12th century. Regarding Dobrinj as a former Glagolitic centre testimony the series of documents and Glagolitic inscriptions. The area of Dobrinj was for centuries an extremely agricultural area. The people were occupied in cattle breeding and olive cultivation as well as in managing the wealth of the forest. The village is famous for its picturesque traditional costumes, its folklore events, the sopele school (Krk’s wind instrument) and the traditional home-made cuisine. In this island’s centre autochthonous rocky houses and narrow rocky streets that breathe days gone by prevail. Close to Dobrinj is the Biserujka cave which astonishes with its beauty and curiosity of its sediment shapes. It is the only cave on the island, among more than 50, that is organised for the reception of visitors. According to legend, the Biserjuka cave (biser-jewel) received its name from the treasure that was found in it, which belonged to the local pirates.